Have you ever wondered how consumers discover, shop and buy in an age of digital disruption? This is something I am going to find out from October 9 to 11 while attending this year´s Shoptalk Europe in Copenhagen. We are happy to be serving as a media partner at the event. Shoptalk Europe will focus on innovation in retail and E-commerce, bringing together established retailers, brands, startups, tech companies, investors, analysts and media. Over 2,000 attendants are expected, including more than 200 speakers from around Europe. I am looking forward to being a part of the event this year – and to my first visit to Copenhagen. Looking at the event´s agenda, I was overtaken by the variety of topics and different session types such as fireside chats, keynotes and presentations. Additionally, the diversity of speakers is impressive: E-commerce representatives ranging from startups such as 3D hubs and Volumental, to famous brands such as Ikea, Google and Tesco. There is also a broad range of industries in attendance, from grocery to fashion and everything in between. No matter if it’s a startup or an established brand, a lot of the speakers are the companies´ founder or CEO. The event´s topics underline the change in global retail and E-commerce. New technologies, trends and business models are a part of nearly all the speeches and keynotes. The richness of speakers and keynotes made it difficult for me to decide which ones I want to attend. As I am very enthusiastic about logistics and supply chain topics, I finally decided where to go. On my first day, I am especially looking forward to the track “On-Demand Delivery & Logistics” with the keynote “Innovations in Logistics” to learn more about the latest logistics trends in retail. In sessions 2 and 3, I am going to visit both parts of “Last-Mile Fulfillment, Same Day and Pickup”. I am interested to hear how leading retailers’ and startups’ ongoing investments in technology, people and partnerships, are improving last-mile infrastructure and their impact on customer acquisition and retention. After the first sessions, there will be presentations, keynotes and fireside chats with the CEOs of interesting E-commerce companies, such as Pinterest and Hello Fresh. Following this, I am looking forward to finding out more about “Disrupting the Retail Value Chain” from leading managers, CEOs and founders of well-known retailers such as Mister Spex, Hawkers, and Eve Sleep. These companies are focused on a single product category and disrupting the retail value chain by creating new direct-to-consumer brands, avoiding some traditional retail inefficiencies. In the evening, I hope to discuss the new insights and impressions with my fellow attendees. I decided to start day 2 with Track 4 “Measuring & Optimizing the New Store Experience” as I am very interested in the current status of store analytics and the applied technology. I also want to know how the acquired data is used to develop the shopping experience in brick and mortar stores. In later sessions, I am excited to hear from companies such as Google, IBM and Shop Direct on what the opportunities and future use cases in retail are for the rising technologies: Artificial Intelligence, Augmented and Virtual Reality. After a break with exciting keynotes from Picnic founder Joris Beckers and Amazon Prime Now Director Mariangela Marseglia, I am going to finish the day with Track 2 “IoT and Connected Commerce.” I hope to find out more about the transformation of shopping due to the Internet of Things and the impact on retail locations and operations. My last day at Shoptalk Europe will start with two really interesting fireside chats with Michael Ward, Managing Director of Harrods, and Philip Krim, Co-Founder and CEO of Casper as well as a keynote by Julia Bösch, founder and Managing Director at Outfittery. 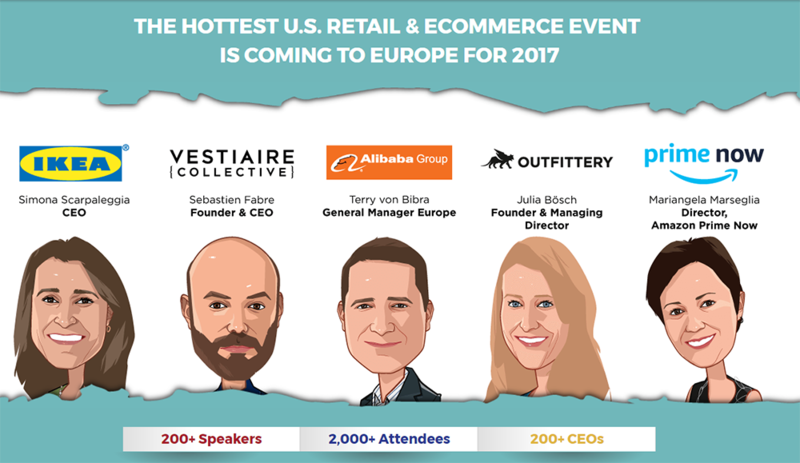 Shoptalk Europe´s agenda addresses the changes in E-commerce and retail on various levels through announcements, debates and questions. I am very excited to expand my knowledge, identify trends and learn from the industry´s thought leaders. The variety of interesting sessions does not make it an easy decision as to which talks to attend. However, the wide thematic range allows a differentiated view on the E-commerce industry and gives many opportunities to obtain valuable information. I am looking forward to networking with the industry’s top leaders and gaining new insights into the current challenges, best practices and strategies in retail and E-commerce. If you are interested in finding out more about the program, click here. Hope to see you there! Don´t forget to secure a 150 Euro discount on your ticket with the code ATSC150.